Curt Cagle, an XML specialist has a nice piece on the the Web 2.0 Job Boom. Curt thinks that there is a coming tech crunch. There aren’t enough programmers to go around. Simple supply and demand … wages are beginning to rise pretty dramatically again, top people in the field have to get social secretaries to handle all of the cold calls and sales pitches, and companies outside of the IT sector are relying increasingly upon community software to tap into the developer base. It is amazing how the popularization of a simple set of technologies called AJAX (which existed for a while but reached the tipping point with Gmail and Google maps) changed the landscape. Lightweight programming languages and agile metholodologies are replacing the over-engineered mega-project and twenty thousand class programming frameworks, turning programming into a cooperative venture where no one person or agency controls the whole network. It definitely is a good time to be a programmer. With dynamic languages, you can produce faster better applications. But more important, you can enjoy your creations being used. Programmers at Google,Yahoo, Flckr, Del.icio.us, Meebo, Technorati, Bloglines must be very happy people. Gaurav Oberoi is a family friend. I dropped him off at Stanford today where his company BillMonk was one of the exhibitors at E27 Summit. Gaurav was excited about the event. It is nice to read about these small companies and their ideas. I know that Gaurav and Chuck quit Amazon a few months ago to start their company and they already have a product and active users. Amazing. This is a very different startup climate, where products and users come before powerpoints and funding. Robert Scoble talks about it in Small Ideas and Big Companies. Michael Arrington of TechCrunch covers it in his Nine Startups in E27 Summit. Glad to see that these small companies are getting a good break in terms of exposure. Thanks to Michael and Robert for paying attention to small companies and others like them. Is this a Web2.0 App? Here is a link to the Web 2.0 Validator. I tried a few sites with some interesting results. Here Harry Chen blogs about the validator. What I really liked was that it led me to 30 Second Rule. 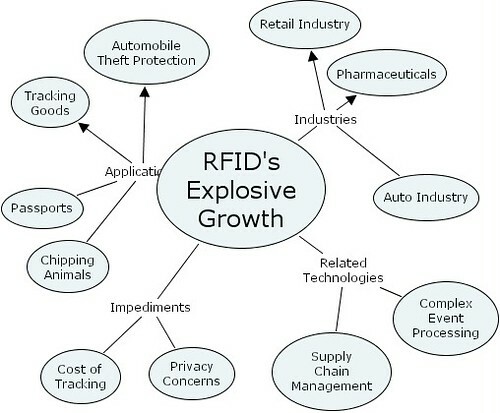 Doug Southerland talks about the expected explosive growth of RFID, some potential application and early adopters. Many technologies need to be in place for this to happen. Here is my attempt at summarizing it. Hind Sights by Guy Kawasaki. Each one of these insights merit a blog post, in its own right. Guy’s “Let the good times roll by” is must read for every enterpreneur. One of the ideas Doug Engelbart often talks about, is the establishment of a “Networked Improvement Community” often referred to as a NIC. For example, if a set of interested participants form a community with the idea of improving the web, then it is a Web NIC. For example, W3C could be considered a Web NIC. In his typical meta-think style, Doug also talks about a NIC of NICs. What is the purpose? You guessed it. The meta NIC helps NICs improve. A NIC is not the same as a community of practice (COP). A COP is more generic. A NIC is a special type of COP focussed on improving something. Both NIC and meta NIC are great ideas. How do we start implementing them? Where are the tools? What are the processes? I might have just found another community which may be interested in doing some work in this space. Here is a link to their wiki page on Ideas and Thoughts for Interlinking Communities. While their focus is not in specifically building improvement communities, they are definitely looking at the semantics of interlinking communities. If they come up with anything we can definitely leverage it to build a NICNet. In this multi-part series, McKinsey & Company taks about the importance of Interactions for the evolution of companies of the future. Currently, jobs that involve participating in interactions rather than extracting raw materials or making finished goods account for more than 80 percent of all employment in the United States. And jobs involving the most complex type of interactions—those requiring employees to analyze information, grapple with ambiguity, and solve problems—make up the fastest-growing segment. One of the notable features of Web 2.0 applications is the increased level of interaction they provide. This is definitely a case for Enterprises to pay attention to the “Interactive Web” more popularly known as Web 2.0. According to Dion Hinchcliffe, Web 2.0 techniques are ushering in the interaction age. In this post, he talks about how technology can help accelerate this process. How to make some original contribution to the world, and in the process not to starve. In this essay, How to Do What You Love, Paul Graham talks about challenges in finding work you love. reduce your money requirement route: reduce what you need to live on so that you can take a couple of years off and do what you like doing. I heard about a friend of a friend who moved to an island in Thailand and lives on $100 per week. He just does what he loves. This is a great essay. Definitely worth a read. While you are at it, check out his other essays. Bill Ives is a KM guru. He is a prolific writer and the author of the book Blogs For Business. Bill makes a great contribution to both the blogging community and KM community with this post and podcast. Blog is a new tool for Personal KM. Web 2.0 applications are sprouting like mushrooms. Lots of people do not like the name. I am not sure whether I like it or not. I am keeping my mind open. One thing is certain. It is getting a lot of attention. Simon St.Laurent has a really nice blog post titled Web 2.0:Simple division? He outlines the architectural shift happening in Web 2.0 applications. To me two success factors, clearly stand out. This has some interesting effects. First of all this data is available in XML which makes it open and easy to manipulate. Second is that you are now building on top of something that is already available content. So many Web 2.0 applications manipulate existing data, combine them, remix them, provide different views of them. You can now build fairly powerful applications in weeks and months using highly productive dynamic languages like Python and Ruby. This allows people to experiment. Produce a simple version of the application, make it available as a beta product and let the users drive the development of future versions. Meebo did this. In 3-4 months they produced a wonderful, useful application and had open discussions about where they were taking the product.